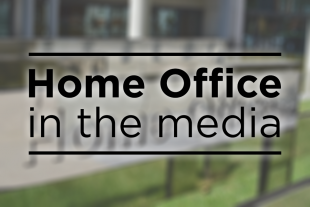 Today’s Home Office stories include the Home Secretary's comments on knife crime, the ongoing trials of members of neo-Nazi terror group National Action, and the findings of a report by the independent chief inspector of borders and immigration. They all note that he said it was his personal mission to get knife crime and serious violence under control and highlighted the fact that he urged police to make more use of the stop and search tactic. Knife crime has a devastating impact on individuals, families and community. To combat serious violence our strategy addresses the root causes of crime with a focus on early intervention alongside tough law enforcement. “To support this we are consulting on a new ‘public health’ approach to tackling serious violence which would see police officers, education partners, local authority and health care professionals being given a new legal duty to take action to prevent it. “We have also announced new £200million Youth Endowment Fund to provide help and support to children and young people at risk of involvement in crime and violence. “A major factor behind the recent increase in serious violence are changes in the drugs market. That’s why the Home Secretary has ordered an independent review of drug misuse, to increase our understanding of who drug users are, what they take and how often so that, armed with this evidence, we can step up the fight against drugs gangs that prey on our children. Most papers report on the trials of members of the neo-Nazi terror group, National Action. The Telegraph and Times report that British solider Mikko Vehvilainien tried to radicalise fellow members of the Armed Forces to join National Action and fight in a “race war.” Vehvilainien and fellow soldier Mark Barrett were convicted and jailed for eight years. The Guardian reports that neo-Nazi couple Adam Thomas and Claudia Patatas were also convicted of being members of the terrorist group. The couple had named their baby son after Adolf Hitler and posed with swastikas and Ku Klux Klan robes. Counter-terrorism detectives believed those convicted yesterday were members of the extreme right-wing group committed to violence. They joined National Action when it was formed in 2013, and the coverage mentions that the group were banned in 2016 after they celebrated the murder of Labour MP Jo Cox. Today’s convictions are a significant success for the police in bringing these members of National Action to justice. “We are determined to tackle the threat presented by extreme right-wing terrorism, as we are all forms of terrorism, which is why this Government banned National Action in 2016. “Keeping our communities safe and secure remains a top priority. Alongside the work to disrupt terrorist activities, we are also supporting those who are at risk of radicalisation through the Prevent programme. The Times, Telegraph, Mail, Express, Mirror, Sun and Metro all report on the findings of a report by the independent chief inspector of borders and immigration that illegal immigrants have “better intelligence than Border Force officers” as they adopt tactics to exploit understaffed checkpoints and ports. The Telegraph includes comments from Border Force officers who say that the organisation is “resourced to fail” and that the border was “not secured by any stretch of the imagination.” The Sun’s line is that officers fail to check the back seats of cars with tinted out windows. The report also said that tougher security measures at Calais and Dover have led migrants to move to other European ports in their bid to reach the UK. Border Force operations along the south coast are part of a wider approach to border security involving close work with both national and international partners. We are pleased that the report recognises that this effective collaboration has resulted in a decrease in clandestine arrival numbers. “We are also pleased the Inspector noted the progress Border Force has made in enhancing its knowledge and management of general maritime threats. The two detections of significant quantities of cocaine off the coast of Cornwall over the summer as well as the recent work of coastal patrol vessels to intercept small boats off the Kent coast are evidence of that in action. “However, we accept that improvements can be made and will be taking forward the recommendations.